Custom printed legal pads makes an extremely value effective giveaway for marketers who are trying to steal thunder from their niche competitors. 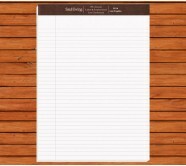 The well-designed and personalized notepads helps in building relationships between the brand and the customer. 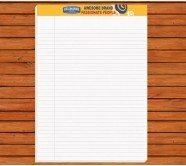 These logo imprinted promotional legal pads are offered in a white or yellow stock and you can select them based on your requirement. These legal pads are basic office accessories that can easily promote your brand name. You can get your full color business logo or contact details printed on each page for FREE. When buying customized legal pads from us, you are all set to enjoy the benefits of free art assistance, free artwork, free online design proof, 110% lowest price match guarantee and fast processing time in the industry. Logo imprinted legal pads work great for law agencies, law professionals, attorneys, notaries and corporates that are trying to trigger a sense of responsibility in their employees. No doubt, these promotional legal pads will make excellent tradeshow or corporate event giveaways due to their high purpose value. Custom printed legal pads may typically be legal writing pad but they are preferred by people of all ages. Be it school students, office goers, employees, businessmen or anyone, they can use these legal pads for scribbling important piece of information, doodling or anything they prefer to do. You can get these legal pads printed with your business information at a very low price from Notepadsdirect.com. 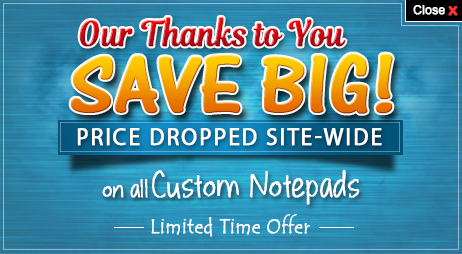 Your personalized legal pads are just a call away at 855-866-8372 or write to us info@Notepadsdirect.com. Our team will try to grasp your requirements when you order these imprinted legal pads. They will work closely with you on finalizing the logo or other promotional details that needs to be imprinted on these legal pads. The affordable promotional legal pads will allow you to keep your brand name flying high with its quality, purpose and high imprint quality. We can deliver you custom printed legal pads in different sheet quantities, sizes and price ranges! Whether you require logo imprinted legal pads in enormous quantities or with precision, we are here to serve you.